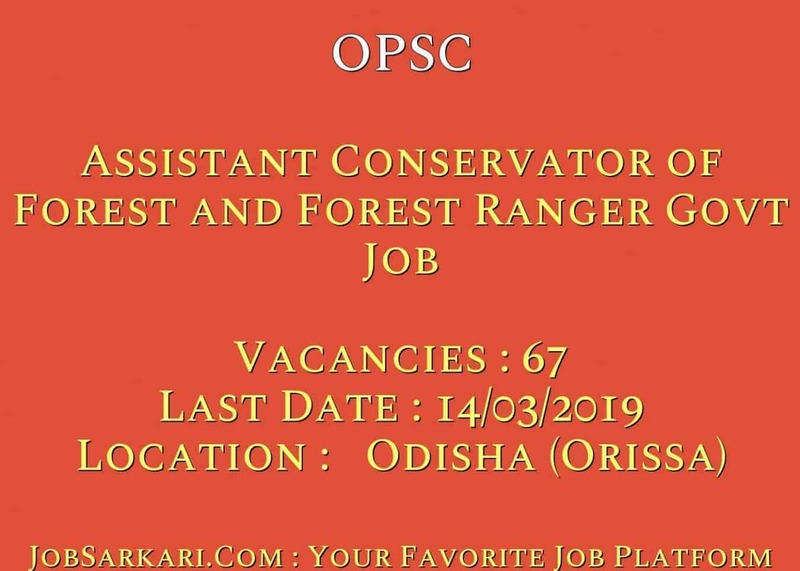 OPSC Assistant Conservator of Forest and Forest Ranger Check Here. OPSC Notification is out. OPSC is recruiting for 67 Assistant Conservator of Forest and Forest Ranger Govt Job Posts. You can check OPSC - Odisha Public Service Commission last date, download OPSC notification, visit OPSC official website and check other OPSC Vacancy details.Complete Vacancy and recruitment Details about 67 Assistant Conservator of Forest and Forest Ranger Govt Job vacancies in OPSC are provided below by JobSarkari.Com only for you. Last Date for Apply Online. 14/03/2019. Last Date for Payment of Fee. 19/03/2019. SC / ST / PH. No Fee. Mode of Payment Application Fee Can be Submitted through E-Challan Making Payment at Any Branch of SBI. Assistant Conservator of Forests 12 03 04 06 25. Forest Ranger 24 13 02 03 42. Total No. of Post 36. 16. 06. 09. 67. Candidate Must Have Passed Bachelor's Degree with At Least one of the Following Subjects Namely, Botany, Chemistry, Geology, Mathematics, Physics, Statistics, Veterinary Science and Animal Husbandry and Zoology or a Bachelor's Degree in Agriculture, Forestry or in Engineering or an Equivalent Qualification. Age Relaxation Upper Age Limit is Relaxable by 05 Years for SC / ST / SEBC / Female / Ex Serviceman. 6. Online Application Can be Submitted on or Before 14th March 2019. Q. What is the Last Date For OPSC Assistant Conservator of Forest and Forest Ranger Govt Job Vacancy ? A. Last Date for OPSC Assistant Conservator of Forest and Forest Ranger Govt Job Posts is 14/03/2019. Q. What is the Form Type of OPSC Assistant Conservator of Forest and Forest Ranger Govt Job Recruitment ? A. The Form Type for OPSC Assistant Conservator of Forest and Forest Ranger Govt Job Posts is Online. Q. 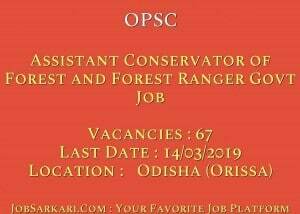 How many vacancies are available in Odisha Public Service Commission Assistant Conservator of Forest and Forest Ranger Govt Job Posts ? A. There are about 70 Vacancies in Odisha Public Service Commission Assistant Conservator of Forest and Forest Ranger Govt Job Posts. Q. What is the Full Form of OPSC ? A. Full Form of OPSC is Odisha Public Service Commission .